The following post contains SPOILERS for Inside Llewyn Davis. Among the many accolades bestowed upon Joel and Ethan Coen’s Inside Llewyn Davis, the biggest have been reserved for its soundtrack. Boston and New York online critics awarded it their Best Use Of Music prize; Los Angeles critics hailed it as the best score of 2013. But lost among the hosannas for the music production by T-Bone Burnett and the stellar performances by the cast is a key fact that opens the door to an interesting interpretation of the movie: There’s a lot of good music in Inside Llewyn Davis, but there’s really one best song. And it’s a duet by a band that no longer exists. The film begins a few months after that band has been destroyed, and follows one of its members, a folk singer named Llewyn Davis (Oscar Isaac), through early 1960s New York. Hopping from couch to couch, perennially broke and beset by endless amounts of misfortune (much of it his own fault), Llewyn repeatedly tries and fails to solidify his shaky solo career. His record label claims there are no royalties due from his first album and club managers refuse to book him. Folk music of the period was often associated with protest songs written expressly to shine a light on some kind of social injustice. Llewyn’s protests are slightly more personal. Society is unjust, all right, but mostly to him. All of Llewyn’s problems stem from a recent tragedy: Mikey, his former collaborator, committed suicide by jumping off the George Washington Bridge. It’s their song, “Fare Thee Well,” that you hear in all of Inside Llewyn Davis’ commercials and trailers. And with good reason; it is a haunting melody with beautiful harmonies. It’s also clearly the most haunting and most beautiful song in the film. Isaac delivers several superb solo acoustic performances, and his voice and guitar playing are consistently lovely. Llewyn also plays occasionally with others, most notably with Justin Timberlake’s Jim on an astronaut-themed novelty song called “Please Mr. Kennedy.” But nothing comes close to the simple perfection of “Fare Thee Well.” Based on all the evidence onscreen, and the assessments of agents and executives, Llewyn isn’t cut out for solo musical stardom. He needed that collaboration. It was everything he had. Inside Llewyn Davis, like many Coen brothers movies before it, has been accused by some of being a cruel and unfeeling portrait of a loser. The Coens’ detractors often call them misanthropes and claim they enjoy torturing their characters just to watch them squirm and suffer. But the flawlessness of “Fare The Well” and the unmitigated disaster of Llewyn’s life in the movie’s present suggest a much more personal meaning. Maybe Inside Llewyn Davis is about the Coens nervously imagining life without one another. Instead of a memory of the ’60s, it’s actually a nightmare of a creative partnership’s messy aftermath. Considered from that angle, an already melancholic film looks even sadder. Certainly the loss of Mikey hangs over Llewyn in almost every scene. A prime example would be the sequence where he wanders into a dinner party held at the home of some Upper West Side academics. They encourage him to play a song and he reluctantly agrees. He starts to sing “Fare The Well” alone, when one of the hosts joins him for some uninvited harmony. Already uncomfortable, Llewyn explodes and storms out of the apartment. Mikey, it seems, is not so easily replaced. The Coens, who’ve worked together for their entire careers, understand that feeling better than almost anyone. Inside Llewyn Davis has been accurately described as a cold film. It’s set in the dead of winter and Llewyn, who doesn’t even own a heavy coat, trudges through snow and wind in nothing more than a corduroy sport jacket. It’s as if Mikey was his heavy coat; without him, Llewyn’s lost his protection from New York’s inhospitable atmosphere. One line in “Fare Thee Well” resonates louder than the rest. 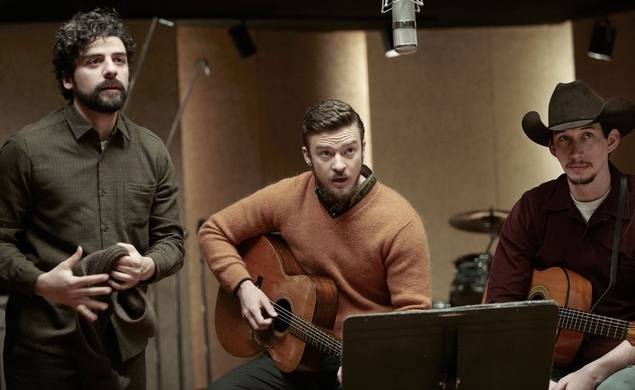 “Life ain’t worth living,” Llewyn and Mike sing, “without the one you love.” Inside Llewyn Davis is the Coens’ gloomy contemplation of what life as a solo act would look like. It is also the product of two men writing, producing, directing, and editing in perfect harmony. That makes it something of a duet itself.